Imagine for a moment the sound of 3 hours with a peaceful, happy baby. And imagine the opposite! About ¼ of babies will experience colic, defined as at least 3 hours of crying per day on at least 3 days of the previous week. Several factors, such as exposure to cigarette smoke, have been proven to increase the chances of colic. The role of food in colic has been controversial, although several studies have shown improvement in some formula-fed babies when switched to an extensively hydrolyzed formula. Breastfed babies can also develop it. Does the mother’s diet make a difference? Researchers in Melbourne, Australia studied 90 babies who had developed colic in the first 6 weeks of life. Half of the mothers in the study went for one week without the most common allergy-causing foods: cow’s milk, eggs, peanuts, tree nuts, wheat, soy, and fish. The other half had a control diet that contained all of those proteins. Neither group had food colors, preservatives, or additives. The results were published online in the November 2005 Pediatrics. At the beginning of the study week, the babies in the two groups averaged 690 minutes and 631 minutes crying per 48 hours. For those moms on the colic diet, 74 percent of their babies ‘improved’ within 1 week (where improvement meant at least a 25 percent reduction in that baby’s crying time – meaning tangible hours of relief for babies and parents). Even for those on the control diet, 37 percent of the babies ‘improved’ over the week – but those who ‘improved’ on the colic diet had greater reductions of crying time. At the end of the week, the difference between the two groups, on average, was 3 hours of crying per 48 hours. What a beautiful sound! 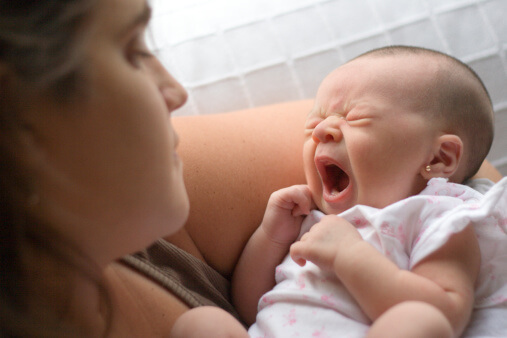 This study is the first randomized, controlled study to demonstrate a clear connection between a mother’s food proteins and the colic symptoms in her breastfed baby. We still have a lot to learn about the effects of diet on colic, but clearly diet can make a substantial difference.